Pigs can't fly, but guacamole just lost a whole lot of calories without sacrificing the taste! The geniuses at the Trader Joe's lab have certainly hit the jackpot with Trader Joe's Reduced Guilt Chunky Guacamole with Greek Yogurt. It has the guacamole taste our taste buds love with a creamy consistency full of real chunks of Haas avocado and hinted with an authentic salsa flair. With only 30 calories per serving your waistline and snacking habits will definitely benefit from this guacamole counterpart laced with chunks of tomatoes, red onion, cilantro, a bit of jalapeño, garlic and fresh lime juice. Definitely add this item to your Trader Joe's List. Photo taken from Trader Joe's website. 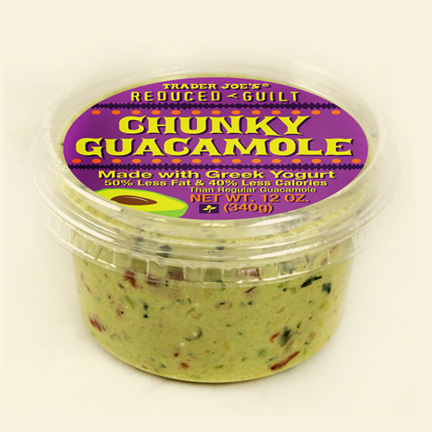 Get nutrition facts for Trader Joe's Reduced Guilt Chunky Guacamole. Greek yogurt is loaded with protein and full of probiotics which do wonders for your digestive system.